Some things just can’t be expressed in words. It is kind of like, seeing the Grand Canyon. It is so huge, you just can’t describe it. No one can understand how big it is without seeing it. There are simply no words, no pictures, you just have to be there to fully appreciate it. We humbly suggested to Promesa Divina that “it sure would be nice… if your choir could come sing at our Dedication Ceremony”. You have to understand, that Promesa Divina is a long ways from Flores. How is this even possible? Transportation at 12,000 feet elevation and up and down the Andes Mountains is just very challenging. Who is going to pay for gas? Are you joking? Well, they were not joking and they said, “We will come!” It all started with a two hour bumpy bus ride up and down the mountains, but , “Wow” was it wonderful. Singing in Quechua and in full indigenous dress, that wonderful group of ladies just sang their hearts out. And, the hills were alive with the Sound of Music. 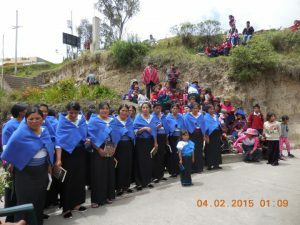 One community in Colta Monjas was reaching out to another community in Flores. That was real magic. They had never met before and now they are there to support each other AND themselves. Lifting themselves up and lifting each other up. This is perfect science in my book. Yes, we will come. Boy, I need to practice that! Yes, I will come. Yes, I will help. Yes, I know I am busy, but I love you and I will comfort you. And, I will come!